Where's the goddamn money!? Where's the goddamn stuff!? And where's my cut of your new action!? You are making an idiot out of me, Tommy, and I'm not laughing yet. Sonny Forelli is a character in the Grand Theft Auto series and the main antagonist in Grand Theft Auto: Vice City (set in 1986). He is also mentioned in The Introduction, a prequel from Grand Theft Auto: San Andreas (set in 1992) and appears in a poster in Grand Theft Auto: Liberty City Stories (set in 1998). He is Don of the Forelli Family, with Vice City Police Department criminal files stating that he came to power young. He is voiced by Tom Sizemore. Sonny Forelli was born in Liberty City. He became the Don of the Forelli Family at a young age according to the Vice City Police Department criminal files. By 1971 Sonny had at least a prominent role in the Forelli Family, leading Tommy Vercetti in an ambush in Harwood (located in Liberty City), telling Tommy he was to assassinate a key mobster. Tommy survived the ambush but was arrested by the Liberty City Police Department and imprisoned. Sonny continued in his various illegal activities, which by 1986 are believed to be rackeetering, gambling, unions, corruption and prostitution, making the Forelli family the most richest and powerful Mafia family at that time. Sonny also begins to make connections to people in other cities around the world, including Vice City based lawyer Ken Rosenberg, who he uses to set up a narcotics deal between his representatives and the Vance Crime Family, wanting his family to enter the very profitable drugs trade in Vice City. Sonny decides to send Tommy Vercetti, as he is too well known in Liberty City, and pulls strings to free him from prison. Tommy, who is suspicious of Sonny's actions, decides to go along with his plans. Sonny, in sending Tommy to Vice City, hopes that he will establish a drugs trading business in the city, which he and the Forelli Family could later take over. Sonny sends Harry and Lee with Tommy to do the deal in Viceport, which is ambushed by Ricardo Diaz' men, resulting in Tommy losing Sonny's money, the drugs and the deaths of Harry and Lee, as well as Victor Vance. Tommy later informs Sonny of the ambush, with Sonny reacting angrily, seemingly holding Tommy responsible for the recovery of the money regardless of whose fault it was. Ken Rosenberg later begins to employ Tommy Vercetti and helps him establish himself in the city, introducing him to a number of the city's key people, including Colonel Juan Cortez, who helped Rosenberg set up the deal, and real estate mogul Avery Carrington. Rosenberg, fearing Sonny, stays in his office for a number of days, but does send Tommy to intimidate two jurors prosecuting Sonny's cousin Giorgio. Tommy begins to establish a business empire in the city, which Forelli hopes will go towards repaying his debt. Tommy, however, continues to expand his business empire, without paying Sonny, and manages to extract revenge for the ambushed drug deal, killing Gonzalez and the cities drug baron, Ricardo Diaz. Sonny, tired of waiting for his debt to be repayed, sends some of his men to collect money from Tommy's numerous businesses. Tommy, expecting Sonny to arrive after his collectors were killed, prepares to give Sonny counterfeit money printed at his print works. Sonny, however, reveals that Lance Vance, Tommy's friend, has joined forces with him and informed him of Tommy and Ken Rosenberg's plan. Being forwarned about Tommy's deception, Sonny came to the Vercetti estate prepared with a large number of gunmen to take over the business for the Forelli Family. A huge gun fight erupts, during which Sonny finally confirms the Tommy's suspicions that he was set up in 1971. The shootout concludes with the deaths of Lance and Sonny, alongside countless Forelli Family mobsters. Salvatore Leone, the Don of the Leone Family, in 1992 informs Johnny Sindacco of the Sindacco Family that the death of Sonny Forelli dealt a severe blow to the Forelli Family, allowing the Sindacco Family to move into Liberty City from Las Venturas. Salvatore states "Ever since Sonny Forelli got himself pasted all over Florida, you think you run things in this town". A film about Sonny's life, entitled "Sonny Forelli: A True Story" is advertised in Liberty City in 1998. Sonny Forelli is voiced by Tom Sizemore. His name is similar to Miami Vice character Sonny Crockett, whilst he temper is similar to Santino Corleone (known as Sonny) from The Godfather novel and film series. Sonny Corleone also voices opinions about becoming involved in the heroin trade, as Sonny does, although Sonny Forelli wishes to deal in drugs in general, not just heroin. Head of Forelli Crime Family. Major crime family in Liberty City. Believed to have major influence in racketeering, gambling, union trouble, corruption and prostitution. Thought to have ordered several mob killings, including Harewood [sic] incident. Only minor charges have ever stuck. Thought to be interested in entering narcotics trade, traditionally a no go area for Liberty City mob. Phone records reveal calls to home address of Ken Rosenberg. Notoriously poor taste in clothes. The player can play as Sonny in GTA Vice City by inputting cheats. 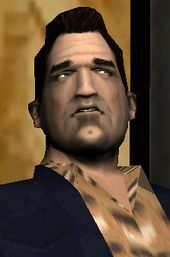 Sonny Forelli, the main antagonist of Grand Theft Auto: Vice City, is one of only two antagonists to appear in only two missions. He does, however, appear more than Massimo Torini, the main antagonist of GTA Liberty City Stories, due to his phone conversations with Tommy Vercetti and his appearance at the beginning of GTA Vice City. Concept Artwork of Sonny Forelli. Sonny Forelli inside Marco's Bistro during An Old Friend. Sonny Forelli about to get killed by Tommy Vercetti. This page was last modified on 21 January 2014, at 23:56.